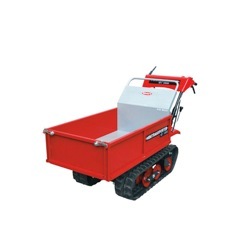 The new Ibea Mini Transporters, sometimes referred to as powered barrows, are a ‘must have’ for anyone wishing to move loads across rough terrain, up steps, over kerbs and around obstacles. Narrow enough to overcome access issues, most models will go through a standard doorway. IBEA’s mini transporters offer exceptional handling due to simple, straight forward, easy-to-understand controls, and operators can be more productive and safer. Models range from 300Kg-600Kg capacity, with options including hydraulic or manual tipping, expandable bed design and dumper bed. The machine is powered by Honda or Subaru industrial commercial engines. Made in Italy with a proven track record of reliability and robustness using reinforced steel crawler tracks.